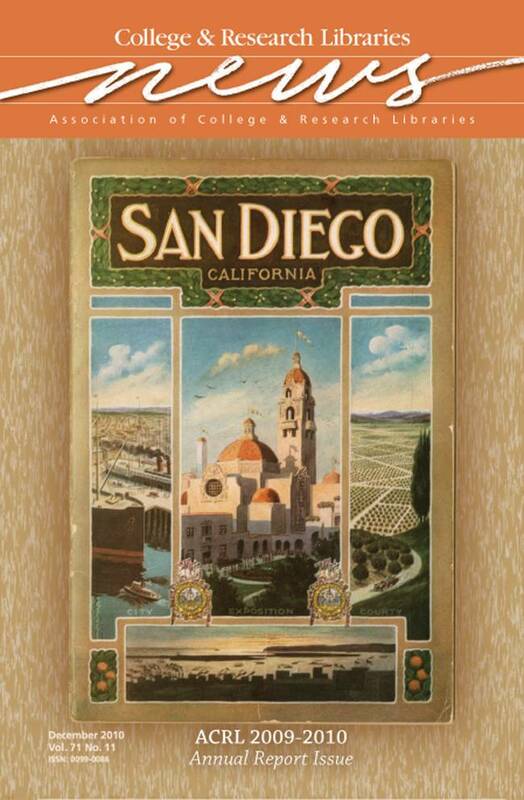 This month’s cover image is San Diego, California: City, Exposition, County. San Diego, CA, produced and distributed by the Board of Supervisors of San Diego County, the Chamber of Commerce of San Diego County, and the Panama-California Exposition, in 1913. The wonderfully hyperbolic prose in this pamphlet, produced in anticipation of 1915’s Panama-California Exposition, sought to lure tourists, institutions, and new permanent residents to a sparsely populated San Diego, host of the 2011 ALA Midwinter Meeting. The pamphlet and exposition touted San Diego County as a place of opportunity. University of California-San Diego’s Mandeville Special Collections Library (libraries.ucsd.edu/locations/mscl/index.html), which owns the pamphlet, is home to an extensive collection of rare and unique historical materials about San Diego and the American Southwest.